Aria Villas Ubud is a 15-minute walk from Antonio Blanco Museum, 18-minute walk from Monkey Forest and a 10-minute drive from the beautiful rice terraces of Tegalalang. The property is reachable by a 1.5-hour car ride from Ngurah Rai International Airport. Featuring Balinese design and architecture, all villas are tastefully appointed with indoor and outdoor dining areas as well as cosy seating areas with plush sofas. Amenities include flat-screen satellite TVs, iPod docks and safety deposit boxes. Each air-conditioned bedroom has a private bathroom with a hairdryer, shower and an outdoor bathtub. Soothing in-villa massages, car rental and diving trips can be arranged upon request. Shuttle service to Ubud is also offered at a fee. Other on-site conveniences include airport shuttle, laundry and babysitting services. Both local and Western dishes can be ordered for breakfast, lunch and dinner in the villa, served in the indoor or outdoor dining area. Wahyu Bungalow and Restaurant Jalan Dewi Sita Ubud, Ubud Indonesia Holiday Homes Accommodation. Nestled in a beautiful tropical garden, Wahyu Bungalow offers a large outdoor pool and Balinese-style rooms with attached bathroom. The hotel is located a 5-minute drive from Ubud Centre. Wi-Fi is accessible for free in public areas. It takes 1.5 hours by car from the hotel to Ngurah Rai International Airport and 10 minutes to the Monkey Forest. Guests who wish to explore the area can make use of the bicycle rental facilities provided by the hotel. Fan-cooled rooms feature large windows that allow much natural light in. They are equipped with a fan and ample storage space. Bathrooms are modern and come with toiletries, a bathtub and a separate rainshower. 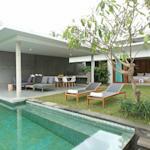 DISINI Luxury Spa Villas Holiday Homes. Jalan Mertasari 28, Bali, Seminyak Indonesia Accommodation. DISINI Luxury Spa Villas Accommodation. The modern villas feature elements of traditional Balinese decor with its thatched ceiling and elegant ornaments. Guests can enjoy the privacy of their own infinity pool, which has a cascading waterfall and a pool deck with a daybed. The Disini Spa offers a wide variety of massages and beauty treatment services to ensure a pampering experience. Car hire is available to conveniently explore the beautiful surroundings. The chef prepares gourmet breakfast daily. In-room dining is available, and a late night menu is featured. Private barbecue parties and poolside dining are both possible upon request. Airport transfer can be arranged at an additional fee. Amarterra Villas Bali Nusa Dua – MGallery Collection Holiday Homes. Score from 131 reviews: Superb 9 Latest booking: 6 hours ago There are 5 people looking at this villa. for this Indonesia holiday home Accommodation. A 3-minute walk to Nusa Dua Beach, the property also offers a fitness centre and restaurant. Each villa features a private pool, dining and seating areas. Air-conditioned bedroom includes a flat-screen satellite TV, wardrobe, telephone and minibar. Private bathroom comes with a shower, bathtub and toilet. Why go on holiday to Indonesia? Breathtakingly diverse, Indonesia stretches across 5,000km and 17,000 islands. There are 300 ethnic groups and cultures speaking 365 languages and dialects. Visitors to Indonesia revel in the splendour of its natural and cultural riches. Glorious sunsets, the dragons of Komodo Island, the coloured lakes of Flores, Balinese dancers, ancient temple sites and bustling multicultural cities are just a few of Indonesia’s attractions. Recent political unrest and economic strife threaten the country’s stability but its natural and human wonders remain. A low-season return from London to Indonesia will cost around £300-450 to Jakarta or £600 to Denpasar. You may find it cheaper to fly to Singapore, which costs from around £220-400, and get a cheap local flight or boat across. A moderate hotel room costs as little as £2 a night. Five-star hotels from £45. As a guide, expect to pay around £700 for a seven-night package to Bali. When should I go to Indonesia? Indonesia has an even year-round climate (in the high 80Fs/30Cs most of the time) dividing into a wet and dry season. The rainy season can be a deterrent to visiting more remote spots as the roads become mud-clogged. May to October is the driest time. Traditionally, European tourists flood the country then, and Australians descend in waves on Bali around Christmas. Indonesians themselves holiday around the Islamic holy month of Ramadan and resort prices go through the roof. What should I do when I’m there in Indonesia? With so many islands, scuba diving and snorkelling is a popular and well-supported activity. Coral reefs and other interesting sites abound. Bali has the best operations in the archipelago. Surfing is very popular and is ever-expanding. Yachting tours are also available. Windsurfing is well established – most common in Bali and Lombok, but also in Manadao in N. Sulawesi. Hiking is not well-established but national parks offer some good treks such as Gunung Leuser, Sumatra and Dumoga Bone on Sulawesi. Java’s Ujung Kulon National Park is the largest wilderness area on that island, but there are many volcanoes there. Bali and Sulawesi have the most developed beach resorts; Java has Pangandaran as its main beach centre. What is there to do on Java? Visit Jakarta – a mad melting pot of nine million people, luxury and poverty sharing the monuments and belching pollution. There are fine museums and Old Batavia, or Kota, centred on the Dutch-built cobbled square of Taman Fatahillah. The city of Yogyakarta oozes culture and crafts of every kind. Borobudur is a mind-blowing Buddhist pyramid and Prambanan a nearly as humbling Hindu temple. Not to be outdone, Mother Nature has thrown in Mount Bromo, a live and dangerous volcano. Also visit the cities of Bandung, Surabaya and Bogor. Kuta Bay is the biggest beach resort. Denpasar in the north is the fast-growing capital of the island. The pleasant, tree-lined streets and the excellent Bali Museum make it worth visiting. Ubud is the serene cultural centre of Bali with excellent galleries, an outlying craft village and a monkey forest. The volcanic landscape of Gunung Batur is a marvel and Lovina is a comparatively peaceful, laid-back beach resort. Temple festivals occur almost every day in Bali. You will see offerings carried to the temple, purification ceremonies and a fair-like atmosphere prevail. At night, performances of sacral dances, Wayang Kulit (shadow) puppets and gamelan music are held. Tourism on Bali has suffered a huge setback since the terrorist bombings in 2002 and 2005 and is still recovering in terms of visitor numbers. What about the other islands? There are thousands but we’ll list some of the more common, and so more affordable. Lombok Island where Ampenan, Mataram, Cakranegara and Sweta merge together to form the main city – Ampenan – is the place for budget travel. Medan is Sumatra’s capital, with fine buildings left from Dutch colonial days. The hill town of Berastagi has good treks around its two volcanoes. Bukittinggi is the centre of Minangkabau culture, bordered by three mountains. Lake Toba is a spectacular lake in a volcanic crater. Samosir is Sumatra’s main resort. Sulawesi has superb beaches and reefs and the famous Tanatoraja highland region where festive funeral rites happen every June/August in beautiful mountainous scenery. Among Indonesia’s fauna you will find orang-utans, Komodo dragons, anoa (a deer-like pig) , the Cendrawasih bird of paradise, the badak jawa (one-horned rhino) and the banteng or wild bull of Java. The Sumatran northern province of Aceh is a laid-back paradise with the splendid Orang-utan Rehabilitation Centre – with not only many apes but elephants, tigers and the seriously endangered Sumatran rhinoceros. Other islands also have wildlife reserves, rainforests, and orang-utan sanctuaries. Accomadation, Accomodation, Acommodation, Holiday Homes. Take A Break Holidays takeabreakholiday, Holiday Homes Accommodation.